Secured $5 million backing from Draper Esprit to democratize big data analytics in finance. 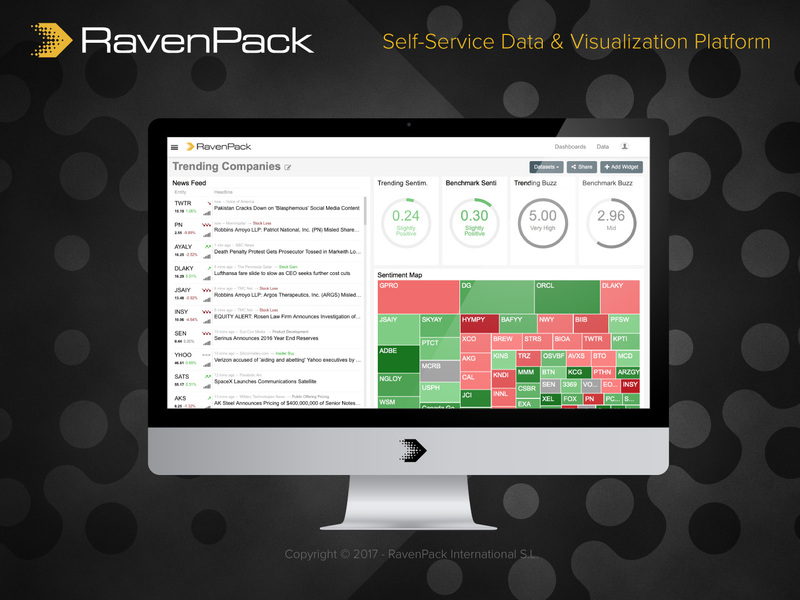 RavenPack, the big data analytics provider for financial services, is today excited to announce the launch of its ground-breaking new product, a self-service data and visualization platform that enables financial professionals to analyze unstructured data for investing and trading, and to support risk management and compliance. The company’s new platform allows users to monitor market-moving events, and quickly surface insights by combining a wide variety of data sets, including stock prices, geopolitical events, newsflow, social media activity, payments data, weather, apps, and data from the internet of things. By using RavenPack’s proprietary sentiment analysis technology, investors can generate predictive insights and evaluate investment opportunities in real time. The company today also announced it has secured $5 million backing from Draper Esprit (AIM:GROW, ESM: GRW), a leading venture firm involved in the creation, funding and development of high-growth technology businesses. The money raised from Draper Esprit will fast-track RavenPack’s mission to transform the way investors gain insights from unstructured data. International investment banking firm EOC Partners acted as advisor to RavenPack on the transaction. RavenPack (http://www.ravenpack.com) is the leading big data analytics provider for financial services. Financial professionals rely on RavenPack for its speed and accuracy in analyzing large amounts of unstructured content. The company’s products allow clients to enhance returns, reduce risk or increase efficiency by systematically incorporating the effects of public information in their models or workflows. RavenPack’s clients include the most successful hedge funds, banks, and asset managers in the world. Draper Esprit (http://www.draperesprit.com) was founded in 2006, and is one of the largest and most active VC firms in Europe, helping entrepreneurs to build global ground-breaking technology companies. In 2016 it moved its primary funds into a listed PLC model (LSE: GROW.L) in order to take a longer term, multi-stage, patient capital approach. In recent years, Draper Esprit’s exits have generated more than $3 billion in combined enterprise value. Draper Esprit is the exclusive Western European member of the Silicon Valley-based Global Draper Network with offices around the world, with portfolio companies including Baidu, Skype, Space X, Tesla and Yammer and other world leading companies.